Long before the “slushee” was used as an instrument of torture and bullying on “Glee”, there was the simple slush. There was nothing like it on a hot summer day in Coaldale. It quenched the thirst, cooled the temperature, and always seemed to hit just the right spot. Just don’t drink it too fast because it would freeze your brain. Most of us call it a Slurpee, but that’s actually the trade-marked 7-11 version of the drink. Slush machines are everywhere now, but once upon a time back in the 1980s they weren’t prevalent, and there were a few different kinds. Thankfully, the current slush won out, going on to satisfy the thirst of millions over the decades and into the next century. One of those "Slush Puppie" cups. The first slush I ever had was called the “Slush Puppy”. It was soft ice poured into a cup with flavouring squirted on top, kind of like a mushier version of the snow cones we used to have at the fair or the circus. 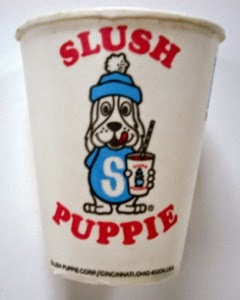 They had “Slush Puppies” at the Club Cigar Store in Lethbridge, where we used to stop to buy magazines (that store still has the best selection in the city) and at the Red Rooster in Coaldale. Once, I went to visit my cousin Carl in Lethbridge, and we'd walked over to the 7-11 where they had this drink called a "Slurpee". Then, one day in the summer, my neighbour Mike came over raving about a “Slush Cat” he had at this relatively new store in Coaldale. It was called Mac’s and, sadly, that Mac’s no longer exists in my hometown. So, the next time we went to Coaldale, I got my parents to stop at Mac’s so I could have a slush. It turns out, it was like the slushes I had had at the 7-11 in Lethbridge while visiting my cousin Carl. 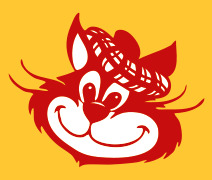 The name “Slush Cat” was part of the brand that was Mac’s back in the ‘80s. The colours were like a brown and gold with some red thrown in, and the official logo was a big cat that I think was giving us all a wink. The staff wore these brown smocks with gold trim too. Beyond that, slush puppies and cats were all behind the counter, poured by store staff members. A far cry from all self-serve, all the time now. 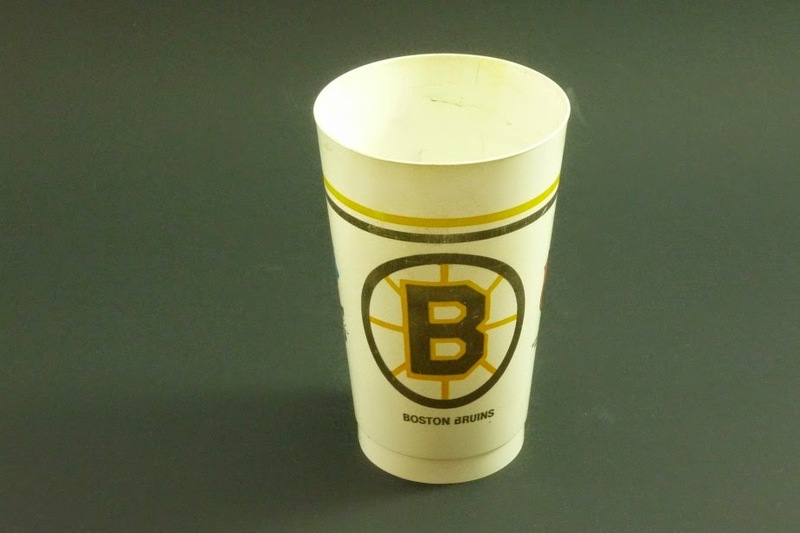 The Boston Bruins' collector's slush cup I sought for months. Not much later, Mac’s introduced a set of collector’s cups. If you ordered a medium slush, you got a cup with a logo from an NHL hockey team. There were 21, but they were all mixed together. The cups sat in stacks on top of the slush machine and you just got the next one they chose. If you could see one you liked, you could ask for it, but the guy would not go digging through the pile to find a particular one. I was – and still am – a huge Boston Bruins fan, so every time we went to town I convinced my dad to go to Mac’s. He had to buy his smokes somewhere, right? I really wanted that Bruins cup – and I eventually got it. But I am also a collector, and a completionist, so I wanted the rest of the set. Eventually I got that too. Like so many other fads in my life, they would sit in a corer in the house until we moved off the farm in 1991. Eventually the “Slush Puppy” faded away, or melted away I guess, and the slush we all know became the norm at every convenience store – Mac’s, Red Rooster, 7-11, or whatever. It was still a treat, because I rarely got to town more than once or twice a week. I remember one weekend when my brother was visiting with his new wife. They were going to town for a slush, and I jokingly asked if they could bring me back one. I figured it would never survive the ride home. But, sure enough, my sister-in-law was sipping on one, then produced one for me. It not only had survived, but it sure hit the spot on a really hot summer day on the farm. When I got to junior high, we walked over to the high school once a week for shop class. That meant cruising downtown to get lunch or at the very least a slush. They were always really cheap too. Beyond that, at St. Joe’s we were not allowed to leave the school grounds ever, even at noon hour. When I got to high school, we could go wherever we wanted at noon. Like anything, the novelty wore off, and I rarely went uptown. One spring, when I signed up to play soccer, our coach Jim Franz took us to Red Rooster after a couple games and treated us all to slushes. It was a nice thing to do for a man who really didn't know many of us personally, and didn't have a son or daughter on the team either. The slush took on a more sinister tone in high school too, not for me but for many others. They started using it as mix and a cover, dumping vodka or rye into a slush, then walking into high school with it. By the time I got to university, we had kind of a convenience store in res called the “Mini Mart” then later “The Marina”. It had its own slush machine. They hit the spot every so often, but I had moved on. Not only had the novelty worn off, but something had changed. Slushes, when drunk too fast, gave me a headache. By the summer of 1987, I had progressed to something else: the Coolossal Cooler from Mac’s, and its cousin the “Big Gulp” at 7-11. They were just big cups of pop and ice, but ended up being more refreshing than the heavier, colder slush. When the 1980s opened, the only really cool drink was pop. Then along came the slush. It was cool, long-lasting, and refreshing. As long as you didn’t drink it too fast and give yourself a headache. As time went on though, it was more than that. It was a social experience. “You want to go for a slush?” was not just an invitation to get a drink, but to hang out, gossip, and socialize. It was as much a part of life as going to the movies, playing video games, shooting hoops in the driveway. I haven’t had one for years, mostly because they are sugar bombs after all, but whenever I do have one, I think about Red Rooster in 1983 or Mac’s in 1987. Great story. I remember Slush Cat’s fondly and preferred them over Slurpees, probably in part because we got cool collector cups like the NHL team ones. Theres still a few Mac’s around here in Lower Mainland BC but its just not the same with the Owl. Ahhh the good old days!